This beautiful set comes with beautiful sentiment. A center diamond, pair of earrings, band and most importantly a wide yellow gold band from this client's father created the perfect set. 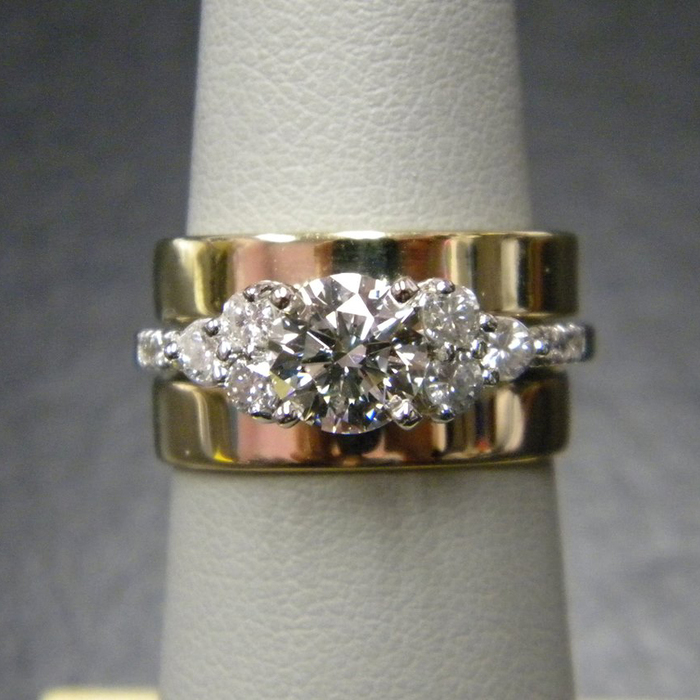 Using the diamonds in the new engagement ring, the yellow gold bands perfectly frame the new engagement ring. And the best part? The hand engraving from her father's ring is still present. Merry Christmas and Happy New Year! Six larger side diamonds are from earrings. Imagine your possibilities! One band was her fathers and the second was made to exactly match his. The bands frame the engagement ring perfectly. A lovely center diamond plus six larger side diamonds from earrings, six smaller side diamonds from another ring created this stunning ring. The design allows the bands to be placed flush directly under the center. 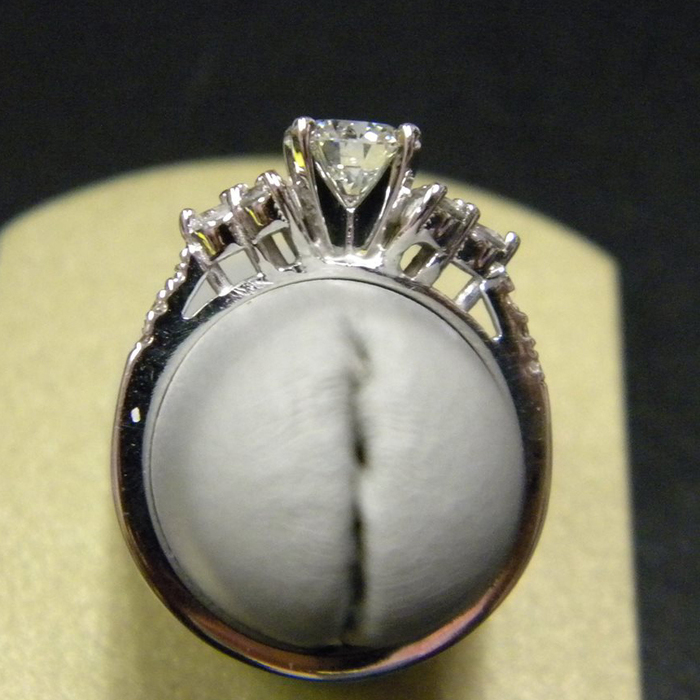 Note the flush portion beneath the side diamonds allowing the bands so slide beneath the center diamond. 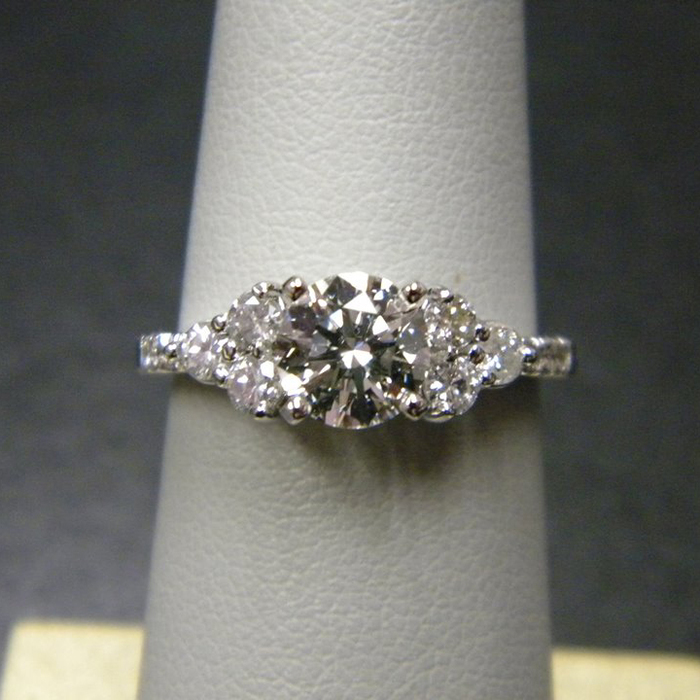 Visit us at Diana Jewelers today and let our trained, helpful staff show you our vast selection of in-stock jewelry. Bring us your old, unworn or broken jewelry, and let us restyle it into something you'll cherish for a lifetime to come.